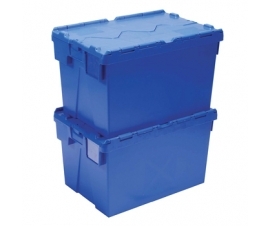 Plastic crates are heavy duty plastic storage boxes with hinged lids (attached lid containers / ALC). 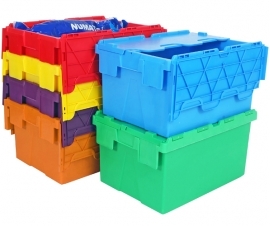 Plastic storage crates are distribution and storage boxes that are designed to stack when full and nest when empty, saving up to 75% valuable storage space. 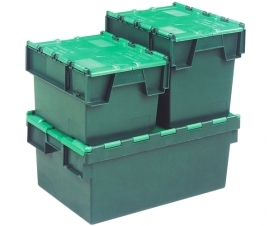 Plastic storage crates are heavy duty plastic storage boxes with hinged lids (attached lid containers / ALC). 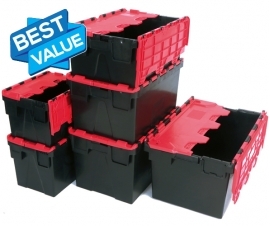 Plastic crates are storage and distribution boxes that are designed to stack when full and nest when empty, saving up to 75% valuable storage space. Attached Lid Containers are sometimes called Tote Boxes, Croc Boxes and Alligator Crates (because of their interlinking lids which resemble teeth). Hinged lid plastic crates are commonly used for many types of applications, such as office moves, distribution, logistics, events and industrial storage. Large crates are commonly used in the removal industry. Extra large 1m (metre) long plastic containers are sometimes morbidly known as Coffin Crates. 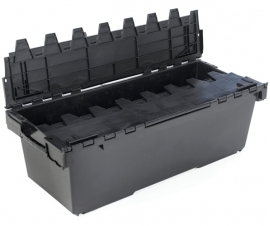 Plastor's range of plastic crates are available in high density Polyethylene (HDPE), Polypropylene (PP) and recycled plastic. Tamper evident seals can be used for added security. Dollies (skates) are available for most sizes (see each product's details for appropriate dolly model).